Allergic diseases are many kinds, ranging from dust allergy, food allergy to sperm. But allergy suffered by a British woman is very rare. It can only be a shower of 10 seconds in a week because of water suffer from allergies. Sufferers can be counted on the fingers, 1 in 230 million people and the world's number only 40 people. Michaela Dutton, a young mother (21 years) from Walsall, England was known to have a health condition that is quite unique and frightening. Dutton water allergy and can not do any contact associated with water. Dutton aware that allergic disease when one day his son in his hand dripping with sweat. Immediately, hands Dutton became red-red, blisters and pain. He became frightened when the rain hit the water and always use umbrellas when travel anywhere and wear protective clothing. 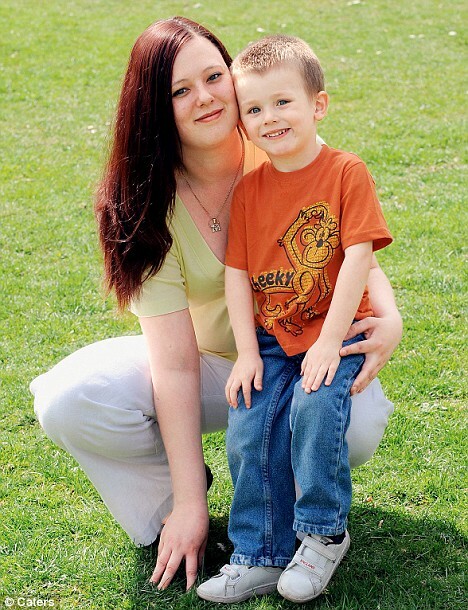 Michaela Dutton with her son. After review to the doctor, Dutton was a condition called urticaria Aquagenic. Allergic conditions turned out to befall one of the 230 million people in the world. Doctors said the allergy was caused by hormone imbalance disorders after giving birth. Because of his illness was, Dutton could not linger near the fruit of his heart if you're sweating. He also must limit the bath up to 10 seconds in a week, if more than that his skin will redden like the burned skin. "I felt imprisoned in my own body. I became a rare meeting friends because they think the disease is contagious," said Dutton. Dr Adrian Morris, a specialist urticaria also said that while pregnant are most at risk when someone has an allergy or urticaria water. Unfortunately, until now no drug that could actually cure allergies water. "This disease is indeed strange. We've tried to give anti-histamine drugs and ultraviolet light therapy to him, but not too successful," said Nina Goad, a doctor at Wolverhampton's New Cross Hospital which is also a member of the British Association of Dermatologists. Goad said there were only 30-40 people in this world who successfully diagnosed with allergies water since 1964. Water allergy symptoms are a few minutes after contact with water, the skin will be red and sore for 15 minutes to 2 hours or more. Likewise, when it contacts water in the throat after drinking water or other beverages. Although the actual cause remains a mystery and there is no cure so far, but experts believe that the trigger is histamine. Others say the cause is that there are ions in water. Researchers are still figuring out the cause sesungguuhnya and treatment techniques were until now still dikembangkan.